WatchGuard AP200 IEEE 802.11n 600 Mbit/s Wireless Access Point - ISM Band - UNII Band - 4 x Antenna(s) - 4 x Internal Antenna(s) - 1 x Network (RJ-45) - Ceiling Mountable, Wall Mountable. Ant online is an authorized Watchguard Technologies, Inc partner. Secure your WLAN from today's sophisticated, blended threats with WatchGuard's new AP100 and AP200 wireless access points. By extending best-in-class UTM security - including application control, intrusion prevention, URL and web content filtering, virus and spam blocking and more - from any XTM appliance to the WLAN, business can harness the power of mobile devices without putting network assets at risk. What's more, security policies can be applied to wired and WLAN resources simultaneously, which is critical to enforcing security standards across an entire network. And unified device management tools offer a "one-stop" configuration and monitoring of AP100, AP200 and XTM devices - reducing setup time and maintenance costs. AP200 and 3 - yr LiveSecurity Bundle. MIMO Technology, Cable Lock Slot. Number of Network (RJ-45) Ports. AP200 Wireless Access PointMounting Kit. FCCICCENRTL/CCBIEEE Standards:802.11b802.11a802.3af802.11g802.1x802.11i802.11n802.3at. Manufacturers change colors and item details frequently and often do not update pictures. We have no personal knowledge or experience with this product or ability to customize it. It usually takes about a week to get your item. There is no human intervention in the process. That is how we control costs and keep prices are so low. NO ADDRESS CHANGE IS POSSIBLE. You can obtain a return label from us or use your own to return an unwanted product during the return window. Full return terms and conditions are listed below. Do not cut out the UPC code until you have examined and tested the product to your satisfaction. Many of the items we sell have Special Return Policies. Please note that 99% of initially diagnosed "Potentially Defective Products" turn out to be configuration or compatibility issues and are not "Defective Products". Non-Returnable Products The following products are not accepted for return once opened and used. Customers must direct repair or replacement inquiries to the manufacturers' authorized service centers for these products: personal hygiene products that have risk of disease transmission if resold; consumables, TVs and monitors, computer components, laser printers, scanners, fax and other devices with delicate optics. To locate a service center near you, please refer to your product manual. Stereo and electronic equipment should be bench-tested prior to installation (units that have been installed, scratched, or abused will not be accepted for return or credit). International Orders are not eligible for return. 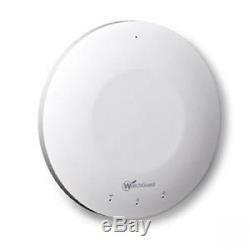 The item "WatchGuard AP200 IEEE 802.11n 600 Mbit/s Wireless Access Point ISM Band UNII" is in sale since Tuesday, July 15, 2014.